The Long Island Neuroscience Specialists offers both minimally invasive surgery and MLS laser therapy options for our patients. Laser therapy has been proven safe and successful and cleared for use by the FDA. MLS Laser Therapy has a strong anti-inflammatory, anti-edema effect on tissues and is effective in treating painful conditions accompanied by swelling or inflammation. With minimally invasive surgery, spine surgeons are able to stabilize the posterior aspect of the spine with smaller incisions and less damage to the ligaments, fascia, and muscles of the spine. Both treatments are effective options for our patients and are recommended on a case by case basis. Laser therapy has been cleared by the FDA and proven successful as evidenced by extensive and credible studies conducted in our country’s finest institutions, including Harvard University. MLS Laser Therapy uses specific wavelengths of light that have a strong anti-inflammatory, anti-edema effect on tissues that are exposed to the laser. This technology is very effective in treating patients with painful conditions accompanied by swelling or inflammation. Photons of laser energy penetrate deeply into tissue and accelerate cellular reproduction and growth. 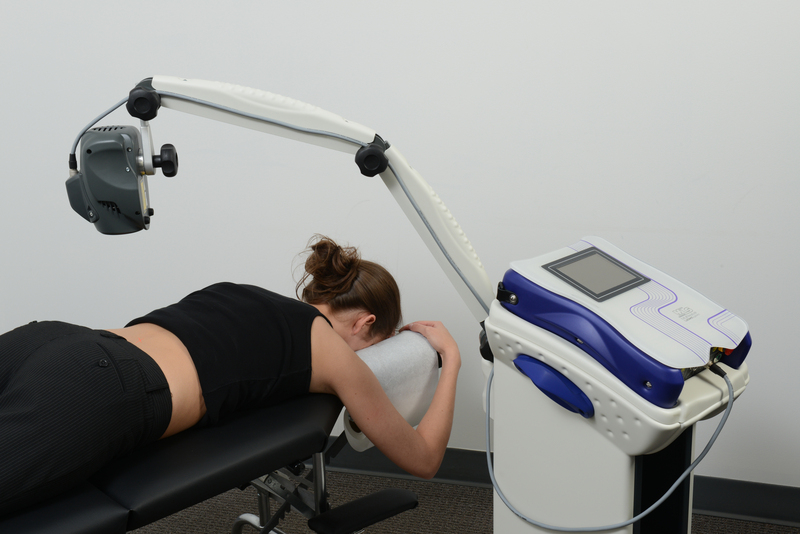 As a result of exposure to the MLS Laser, the cells of tendons, ligaments and muscles repair themselves faster. As inflammation is reduced pain subsides very quickly. In simple terms, laser energy kick-starts the healing process, thereby speeding recovery. There are no known side-effects! Laser therapy is cleared by the FDA and is safe and effective. With the advent of Minimal Access Spinal Technologies, spine surgeons are now able to remove herniated intervertebral discs in the lumbar spine that are putting pressure on the spinal nerve roots and causing pain, in a minimally invasive fashion for the first time. Minimally invasive technologies also are allowing spine surgeons to stabilize the posterior aspect of the spine with smaller incisions and less damage to the ligaments, fascia, and muscles of the spine than with a traditional “open” posterior spinal fusion. This minimally invasive revolution has impacted virtually every surgical field. In the case of lumbar discectomy, the primary objective is to decompress the affected nerve root. The compressed nerve must be left fully decompressed and freely mobile. This may require extensive bony decompression, nerve root manipulation, and/or removal of herniated nucleus pulposus. Minimal Access Spinal Technologies have been developed out of advances, in the field of orthopedic minimal access surgeries over the past two decades. Many surgical sub-specialties use fiberoptic video cameras, endoscopes, catheters, and specially designed tools to assist in performing surgery with much smaller incisions. Today, some of these procedures have become the standard of care in orthopedics, cardiology, and gastro-intestinal medicine. Most people are familiar with this type of technology in the form of “arthroscopic” surgery, which allows orthopedic surgeons to look inside joints like the knee and operate through very small incisions. Many people have also become familiar with this type of technology through cardiac catheterizations that are used to treat coronary artery disease, and endoscopies that are used for the diagnosis and treatment of problems of the digestive tract. The development of Minimal Access Spinal Technologies continues to push and promote the advancement of spinal surgery.